A fully encompassing tour of 14 countries. You will visit ancient cities and see beautiful landscapes. Marvel at famous landmarks such as the Eiffel Tower, Leaning Tower of Pisa, The Acropolis and Temple of Zeus. Discover stunning surroundings in the Black Forest, Biarritz, Monaco and the Rhine Valley. The benefit of this tour is that you can choose from a plethora of optional experiences to suit your preferences and budget. Depart London. See the famous White Cliffs in Dover where you cross the Channel by ferry to Calais in France. Head south from Calais across WWI battlefields of the Somme to Paris. Paris at night is a city transformed. Enjoy this superb ‘City of Light’ on a leisurely cruise along the River Seine. Afterwards, as we drive through this amazing city, we’ll stop at some vantage points for you to capture the fascinating sights on camera. In summer, this trip may take place before sunset. This morning you are taken on a panoramic tour of the famous landmarks including; the Champs Élysées, Arc de Triomphe and the Eiffel Tower. Afterwards there is time for you to explore on your own. As you leave Paris you journey through the picturesque vineyards of the Loire Valley and pause for a visit in the city of Tours, where you have some free time. Later you will travel to the delightful city of Bordeaux. Today you will travel to the glorious coastal resort of Biarritz and see some fabulous views of the ocean. Then you travel over the border into Spain. You pass through the hills of Navarra and onto Pamplona; famous for the annual bull run. Enjoy a walking tour of charming Pamplona with our Local Specialist. See the ancient walls, views over the city, the beautiful old town and the Cathedral before retracing the steps of the famous ‘Running of the Bulls’. Then savour tapas and sangria at Hemingway’s favourite watering hole, the most beautiful and historic café in town! Enjoy a sightseeing tour of some of Madrid’s famous landmarks including; the Royal Palace and Plaza de Espana. Spend today exploring the city on your own with some free time. Madrid has so much to offer from shopping to museums there is something suited to everyone. Visit the ancient capital of Spain, which sits above the River Tagus and is home to the nation’s principal cathedral and El Greco’s famous views. Learn about Moorish and Jewish cultures, and how the area is famed for the production of Damascene work: intricate inlaid gold jewellery and craftwork. This evening you’ll have the chance to admire the elegance of Madrid’s new city, with its wide, tree-lined avenues and decorative fountains, before you experience the flavour of the old. Join the locals in a chat, and people-watch as you sip an aperitif before enjoying a delicious dinner. Leave the vibrant city of Madrid behind and travel past the vineyards in Catalonia before arriving in the bustling city of Barcelona. Enjoy a sightseeing tour including the Ramblas and the Sagrada Familia Cathedral. Enjoy today exploring on your own. Come and experience the passion and spirit of Spain at a spectacular flamenco evening. This modern interpretation of Spain’s most famous entertainment is one of the best shows in town, and we’ve even included dinner and drinks. Today you bid farewell to Spain and cross back over the border into France. Travel through Provence and onto the French Riviera and to the famous film festival city of Cannes. 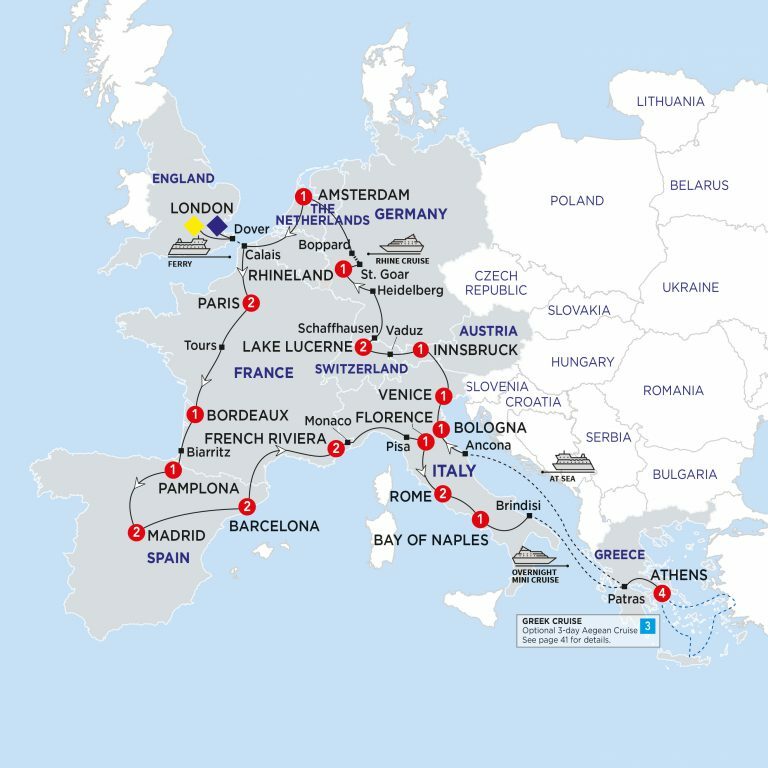 Relax and enjoy a day choosing what you’d like to see and do in this stunning area of Europe. Join us on a drive inland towards the mountains to visit the historic, walled hilltop town of St. Paul – an artists’ paradise. We’ll continue along the Riviera, passing through glamorous Nice and travelling on the Corniche roads as you admire the spectacular views, before arriving at a characteristic restaurant for a delicious meal including drinks. A lovely drive into the Esteral Heights bring us to the quaint walled hilltown of St Paul de Vence. Our walk through the village’s winding streets with a Local Specialist reveals elegant fountains,vine-covered ramparts and interesting galleries. Then, because no visit to the Riviera is complete without it, we continue to glorious Nice to enjoy the city, its old town and colourful provençale markets. Visit Monaco where you can admire views of the harbour and palace. Marvel at the Leaning Tower of Pisa before later arriving in Florence. Discover the quality and workmanship of one of this city’s historic industries at a demonstration of Florentine leather craft. Then, explore wonderful Florence with time to wander through its cobbled streets before arriving in the eternal city of Rome. Starting with a lovely drive and continuing on foot, you’ll discover hidden backstreets, piazzas and fountains of the ‘Eternal City’ with a Local Specialist. Along the way, you’ll marvel at the timeless Pantheon, the best-preserved Roman temple in the world. Many additional highlights are revealed on this relaxed tour that also offers free time in a gorgeous Baroque square with street artists, trattorias and gelaterias! Enjoy a sightseeing tour of the famous landmarks in Rome. Visit St. Peter’s Basilica, featuring superb works of art and see the magnificent Colosseum and the ancient sites of Rome. Spend the rest of the day as you wish. We skip the lines at the Vatican Museums for this tour that shows not just remarkable works of art collected and commissioned over the history of the Papacy, but also Michelangelo’s amazing ceiling frescoes in the Sistine Chapel. Later we hear fascinating tales of gladiatorial combat and more on our visit to the Colosseum, again with time-saving VIP entrance. Head south from Rome to the spectacular Bay of Naples. Come with us for a drive along the famous Amalfi Coast. You’ll have a chance to visit the exclusive artists’ paradise of Positano, which is magnificently positioned on the Mediterranean coast. Enjoy some free time in the Bay of Naples before we travel to the port of Ancona where you will board your overnight ferry to Greece. Join our expert on a tour of the excavations of Pompeii, the perfectly preserved Roman town which was engulfed by Mount Vesuvius’ eruption in AD 79. You’ll witness the devastating destruction it had at the time, as well as the opportunity to go back in time and get a glimpse of everyday Roman life, frozen for almost 2,000 years. Your ferry arrives in the port of Patras and then the journey continues onto Athens. Decide on whether to spend the next few days exploring this glorious city on your own or perhaps taking a 3-day Aegean Cruise instead. Enjoy a day relaxing or exploring this wonderful city. Take a relaxing trip down to the southernmost tip of Mainland Greece to see the fifth century B.C Temple of Poseidon at Sounion. See if you can spot where Byron carved his initials on one of the temple’s sixteen columns. Marvel at the sheer rugged beauty of the coastline and the ancient temple perched above a 197-foot drop down to the Aegean Sea below. Stand above the site of the world’s first lighthouse, overlooking an area steeped in classical Greek history, ever since the tragic King Aegeas threw himself from the rocky precipice into the sea below, thereby giving his name to the Aegean Sea. The slopes of Parnassus Mountain are home to Delphi, home to the Oracke and the centre of the universe for the ancient world. Visit the Sanctuary of Apollo, the Stadium & the Temple, as well as the museum of Delphi – home to over 10,000 artefacts, including the famous bronze Charioteer. In addition, you will also pass through the typical mountain Greek village of Arachova – famous for its cheese, matured in nearby caves, and for its flokati rugs. Spend another day exploring this ancient city. Depart for Flisvos harbour where you board your ship for a memorable full day cruise to the three idyllic Saronic Gulf Islands of Aegina, Hydra and Poros. Enjoy a day out on the crystal clear waters of the Aegean sea. Lunch is included on board the afternoon holds a small show to keep you entertained for the return journey. Take a sightseeing tour this morning and see the Temple of Zeus and visit the Parthenon, Acropolis. Later in Patras board your overnight ferry to Ancona, Italy. Arrive in the port of Ancona and travel north to Bologna. Head north through the Emilia Romagna region to magical Venice. Cruise by private launch to St. Mark’s Square. Enjoy a glassblowing demonstration at a traditional workshop. Spend time afterwards exploring. Join us as we discover the Venetian Lagoon by private boat. You will enjoy a delicious meal with a selection of drinks on the fishermen’s island of Burano, famous for its multi-coloured houses – a real photographer’s paradise. Travel through scenic mountainous landscapes including the majestic Brenner Pass into Austria before arriving in Innsbruck. Your orientation includes views of the Golden Roof and Hofburg Palace. Visit Vaduz, capital of Liechtenstein, then drive through scenic alpine landscapes to lovely Lake Lucerne. Dine tonight at your hotel. We’ll ascend by cog-wheel train to Mount Pilatus’ summit, where you’ll have time to explore, admire the views, and breathe the pure air. Then, we’ll descent by cable-car to enjoy a scenic lake cruise. On certain departures this Optional may be operated in reverse. Travel into the heart of Lucerne where your orientation will reveal the Chapel Bridge and Lion Monument. Afterwards consider taking an Optional Experience up Mount Pilatus for spectacular views over the Alps. Tonight we’ll enjoy a tasty Swiss meal, including the famous Swiss cheese fondue, in a typical restaurant. While enjoying dinner, you can also join in a lively folklore show which includes yodelling, flag-throwing and Alpine horn-blowing. Two drinks are also included. A chance to get to know the Swiss, you’ll meet local farmers and enjoy a delightful countryside tour in horse drawn carriages. Soak up the stunning scenery as we trot around a typical rural community, en route to a working farm where you’ll savour local drinks and snacks. Marvel at the mighty Rhine Falls at Schaffhausen before crossing the border over into Germany. Pass through the Black Forest and make your way to the university town of Heidelberg. View the imposing red sandstone castle towering above the city before making your way to the hotel. This morning relax aboard your cruise through the Rhine Valley. See the famous Lorelei Rock and see medieval castles and vineyards. Then continue to the Dutch border and make your way to lively Amsterdam. Join us for a delicious meal of Dutch specialities, including drinks, in the elegant surroundings of this historic house. Later you’ll board our private boat and glide gently along the canals, under picturesque bridges and past elegant town-houses built on the water’s edge. Drive back into France to Calais where you board your ferry back to Dover. Arrive later in London and bid farewell to your Travel Director and newfound friends at the end of this memorable European Discoverer. London airport transfers are available to purchase, conditions apply.